The fire dropped down into the Grose Valley below Lockley Pylon today (Thursday 24 October 2002). We were watching from Govetts Leap lookout as the large helicopter returned with another load of water, again and again. It was going beneath the cliffs and so close to them. 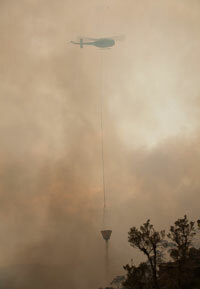 The other little helicopters were coming and going, dropping water on the fire, working in the valley behind, looking like tiny insects in the depths of the Grose Valley. 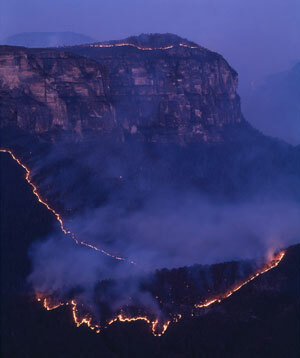 The helicopters left for the night and the flames flickered on the cliff below Lockley, another red line of flame slowly inching upwards on the cliffs of the Perrys Lookdown Headland on the other side of the valley. There was smoke in the valley behind the two landmarks. In the darkness, from Govetts Leap lookout, we could see a thin, almost straight, red line stretching all the way across the valley from Lockley Pylon to Perrys Headland. 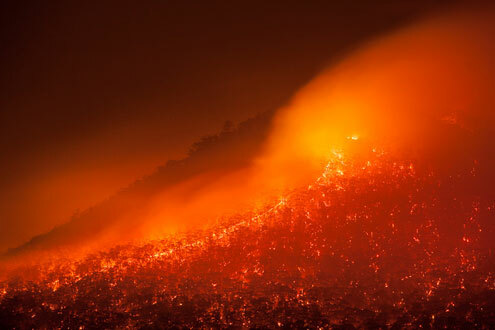 There was another short red line on top of Perrys Headland where it was burning. It didn't really look like fire, just a thin red line, and no smell of smoke, the westerly wind blowing the smoke away from us. We went to the Conservation Society’s general meeting at The Hut then came back to the lookout. There were a number of people there, watching the fire, and the smell of smoke and a cold easterly wind blowing up from the valley, the line of fire taking the shape of two giant arrows pointing towards the cliffs between Bridal Veil and Horseshoe Falls. Away from the lookout there was barely the slightest breeze, all was still and clear. 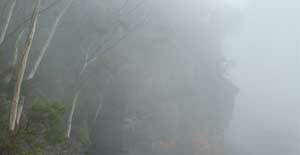 In the morning we woke to find the haze surrounding us was not smoke but a cool, moist, mountain mist. This article first appeared in the November, 2002 edition of Hut News and in November 2010 on the Greater Blue Mountains World Heritage Experience website.